State Rep. Joe Don McGaugh (R-Carrollton) says he’s running for Missouri House Speaker Pro Tem. “You know Speaker Pro Tem is a position that is voted on by the entire House, much like the Speaker. If the Speaker cannot act, you’re basically kind of the right-hand man so to speak of the Speaker,” McGaugh says. McGaugh represents Carroll, Chariton and Ray counties in the Missouri House, and chairs the House Civil and Criminal Proceedings Committee. He was first elected to the House in 2012 and is finishing his second term. McGaugh says he’s received positive feedback from his GOP colleagues, on his bid to become Speaker Pro Tem. “Me being from northwest Missouri in a rural area, when I get to St. Louis and Kansas City and Springfield, it’s good to talk to those folks. Although I may be from a rural area, we share a lot of things in common,” McGaugh says. McGaugh says he wants to help House Speaker Todd Richardson (R-Poplar Bluff) pass “common sense, conservative legislation” in upcoming years. The Speaker Pro Tem position will be voted on by the GOP Caucus in November, then by the full Missouri House in January. Republicans currently control the chamber 116-45-1. Despite his conservative voting record, McGaugh notes he works well with Democrats, especially on the Committee he chairs. He says the best legislation you can pass is when you’ve compromised and worked with the other party to get a good piece of legislation. 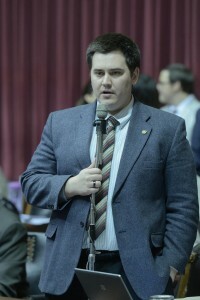 “And I think if you talk to the Democrats that serve on my Committee, Gina Mitten, Mike Colona (both St. Louis Democratic State Representatives), just to name a few, I think they would tell you that I am someone that can work with them and work to basically accomplish what’s for the greater good of the state of Missouri,” McGaugh says. McGaugh also praises Speaker Richardson and outgoing Speaker Pro Tem Denny Hoskins (R-Warrensburg), who’s seeking a Missouri Senate seat. Hoskins is prohibited from running again for the House because of term limits.